I love to interact with students in a classroom setting. One of the most interesting parts of being a professor is the real-time Q&A. It can be a lively, engaging, and informative time. We all know who “that guy” is in your seminary class. He’s the one who can’t resist the opportunity to ask a question or make a comment. He’s the one trying to show he knows more than the professor, and perhaps more than the apostle Paul himself. He’s the one who thinks that your class of 40 students is really just his personal independent study that everyone else is observing. 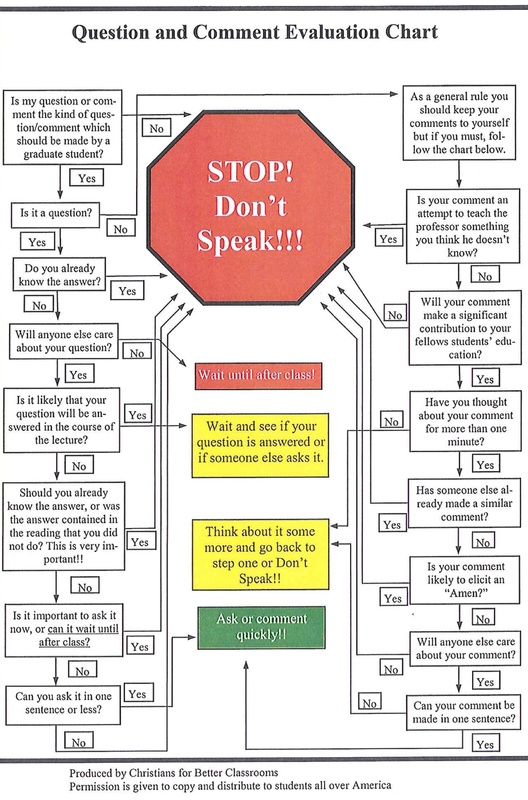 For just such a student, I encourage them to have a look at this Q&A flow chart below created by Randy Stinson. Every student should be required to have a copy of this chart open on their desktops during class time. If nothing else, by the time the student processes their question through this grid, they will have likely missed the chance to ask it! For a PDF file of the chart, see here. I have a feeling I’m that guy… How embarrassing!